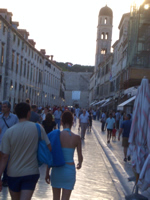 Placa or Stradun street is the main open urban area of Dubrovnik and the most favored promenade and gathering place. It is the venue of all public feasts and processions, but also the main business street of the City core. The widest and most beautiful street divides the City into northern and southern halves. At the same time it is the shortest communication between the western and the eastern City gates. The length of Placa street is about 300 meters (1000 feet). 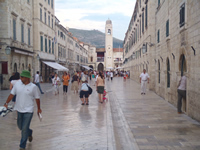 Placa street was created as a consequence of trade and growing socio-economic ties between the Roman-Greek settlement on the islet Lave and the Croatian-Slav settlement on the mainland. 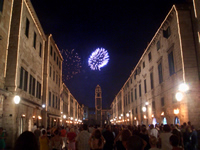 The small Roman-Greek group inter-mixed with Croatian-Slav people and in the 12th century Dubrovnik is a Croatian-Slav city. From the 14th century Croatian element is completely dominant. At the end of the 11th century the shallow channel separating the settlements was filled with earth in order to join them. This filled up channel is what is today Placa street. Placa acquired its proper function at the close of the 12th century when both settlements were enclosed by a single City wall and became one urban whole. The Placa street was paved in 1468. The limestone pavement is polished by use, smooth as ice, and it shines bright, mirroring light, as if the surface was not stone, but glass. It is interesting to notice that one half of Placa street is paved in fish rib pattern facing one one direction while the other half of the street is paved using the same pattern only facing the other direction. At the interchange of two patterns there is a single, small, rectangular limestone embedded in the pavement, the only different piece in the whole "puzzle". The name Placa is derived from the Greek and Latin “Platea” which we translate as “street”. The other name, Stradun, is a Venetian sobriquet used ironically in the sense of “Big street”. The present look of Placa street was acquired after the earthquake of 1667 when Dubrovnik was hastily rebuilt from destruction and fires. The picturesque diversity of the former places of old Placa was replaced by planned and unified construction of two rows of stone houses built in Baroque style, of equal height with similar fronts and similar internal arrangement. This neat and uniform look is a sort of a trademark and one of the biggest charms of Dubrovnik today. You will notice that the shops, bars, and everything else in the City looks almost uniform. There are no neon lights, huge advertisements, billboards, or similar modes of aggresive advertising. 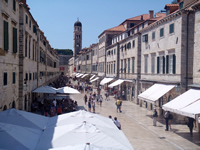 The reason is the local regulation that requires the merchants to respect the traditional look and feel of Dubrovnik. The merchants are allowed to have only discrete prescribed signs to identify their business.